Stefano Maconi was one of Catherine’s later companions, not joining the group until 1376 after his mother sent him to Catherine to help diffuse a feud between him and the Tolomei and Rinaldini families, who were powerful Sienese families. He belonged to a smaller noble family in Siena. 1 He became one of her main scribes and wrote down Catherine’s theology, The Dialogue, while she dictated to him and other scribes. He was not as noble as some, and not as politically powerful, but he proved very useful in his scribal duties, he overshadowed the female scribes she initially used when he traveled with her. His friendship with Neri was deep, in modern terminology evidence shows they were “best friends”. After he joined the group, the females had to take on a new role within the group. Stefano’s dedication to Catherine continued post-mortem while he gathered the largest collection of her letters and preserved them for future generations. Many letters are addressed to him, as she sent him on missions occasionally, and Catherine liked to stay in touch with her family while they were away. He maintained political power throughout his time with Catherine as an elected official from 1373-1380. 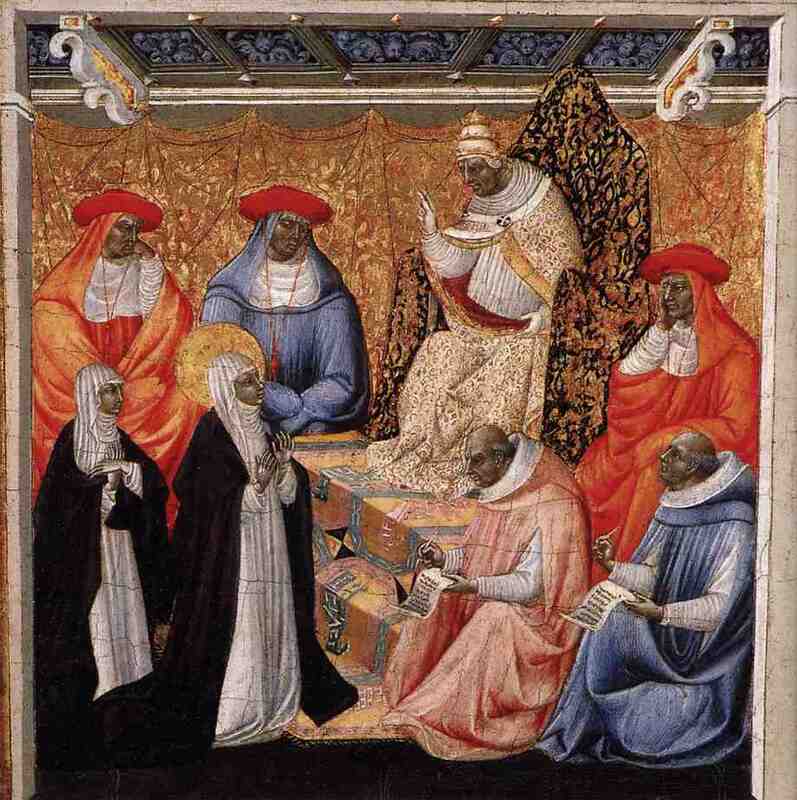 Some sources show that Stefano did not spend all of his time with Catherine, contrary to popular belief, but stayed in Siena to handle his obligation to his natal family and his political offices. This allowed him to deliver messages on behalf of Catherine in the Siena region to the government or outside affiliations. In 1381, he joined the Carthusians where he found great success, becoming prior and prior general, fulfilling Catherine’s final wish for his life.2 His life as a Carthusian kept him in a position of power until his death in 1424. Bartolomeo da Siena wrote a hagiography of him titled, De vita et moribus beati Stephani Maconi in 1626.